You can find out about the history of the James Theatre in this delightful book, written by local historian, Michael Williams. It is available for purchase from the Friends of James Theatre for $10 plus postage ($5). Please contact us if you would like a copy, or buy one on your next visit to the Theatre. Not only is this an entertaining look at a bygone era in Dungog (you will hear about such things as how old Ma Burrows used to keep the youngsters under control at cinema showings) but all proceeds go to help with the upgrade of the Theatre. Open air films were first shown on the Theatre site in December 1912. In 1914 the original owner, Mr James Stuart, commenced construction of the Theatre roof and by 1918 the original wooden building had been completed. In 1930 Mr James, as he was known, completed an extensive upgrade of his Theatre, adding the foyer, with a new projection box above, and Spanish Mission facade to the front of the building. At the same time a large stage with dressing rooms and a large supper room and kitchen underneath were added to the rear of the building. 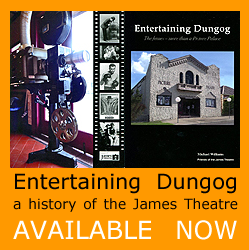 The James Theatre, as it came to be known, was the social hub of Dungog, not only for its film screenings, but its balls and dances, catered for by the Wattle Club ladies. The original kitchen, still in the building today, shows just what a challenge it would have been for those hard working ladies, who served supper in sittings to accommodate the large numbers of patrons. The Theatre was passed from Mr James to Mr James Junior and then to Mr Bill (the third Mr James having not returned from World War 2). The Theatre fell on hard times and fell into disrepair until it was purchased by the Dungog Shire Council in 1979 to provide a large function centre for the community. Cinema screenings were continued during the 1980’s and 90’s and until 2007 by a dedicated Ken Reeve in spite of the increasing challenges posed by television, videos, dvd’s and, finally, internet downloads. Ken Reeve was followed for a few years by the Hopson family who faced the added challenge of the rapid transition from 35mm to digital films. Since then the community has worked to keep the Theatre building operational for films, live performances and functions. The Friends of James Theatre Inc and Dungog Council are working to ensure that the James Theatre remains a viable and functioning part of the Dungog community into the future. Recently the facade of the Theatre was repainted in colours appropriate to its Spanish Mission Style and the original colours of the Theatre. Painting of the foyer and renovation of the kiosk has been completed. Large scale restoration works of the old supper room under the stage and the toilets have been completed. New curtaining has been installed throughout the Theatre including a deep red velvet stage curtain. A new stainless steel kitchen has been installed and is available for functions of up to 140 people. The kitchen fitout is now complete, together with improvements to the storeroom. The outdoor area has been landscaped, allowing functions to spill out into a pleasant open air space. Further renovations will continue in 2016, including the painting of the exterior walls, and improvements to the main cinema screen.